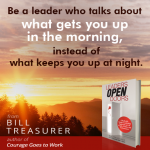 I am delighted and honored to present this guest post by Bill Treasurer, a very articulate leadership developer and a genuinely good guy. Bill is the Chief Encouragement Officer at Giant Leap Consulting. The proceeds of his new book, Leaders Open Doors, are being donated to charities that serve children with special needs. Read Bill’s thoughts on leadership and respect below. Respect. Everyone wants it, and when we don’t get it – or worse, when we get its opposite – we can get pretty feisty. Effective leadership requires respect. When people respect you, they’ll follow your directives and make your goals their own. In short, they’ll be committed to you. Without respect, at best you’ll get passive compliance, and at worst you’ll get committed mutiny. “If you ever talk to us like that again, I’ll walk. What’s your goal in yelling at us like that? To make us afraid of you? At what cost? I have enough self-respect to not allow myself to be berated like that by anyone.” Steve, one of my first employees, said these very words while staring me in the face. I walked away from my conversation with Steve angry. That night, while nursing a beer, I kept playing the conversation over and over in my head. The more I thought about it, the more I knew Steve was right. I had pulled rank on Steve because I was embarrassed. The truth was, I had no idea who I was as a leader. Instead I had resorted to adopting the leadership style of my predecessors. My behavior was an echo of theirs, all linking back to my original leadership role model: my dad. Some people subscribe to the idea that you have to “command” respect. From this vantage point, respect is best evidenced when the people you’re leading submit themselves. And submission happens very quickly if you can make them afraid of you. It’s an effective model, by the way. Throughout history whole armies have marched to the dominance/submission model of respect. Commanding respect easily slips into fear-stoking behavior on the part of the leader, and outside of the military it doesn’t work very well. Sure, some workers will submit themselves to the behavioral dominance of their leader. But even those who do will stew with resentment, gathering strength like a coiled spring, ready to leave when the timing is right. Steve’s raw and courageous feedback made me reconsider the leader I was becoming. The truth was, I didn’t even care for some of the leaders I had worked under. And my dad’s temper could be scary. I didn’t want to be that leader. I wanted to be respected, but not out of fear. I wanted to be respected by being respectful. Turns out there’s another way to garner people’s respect. You earn it. You do that by taking an interest in their career goals and aspirations. You look for opportunities to help them grow and develop. You give them candid, helpful, and supportive feedback so they can improve. “Earn it” respect takes time, effort, and attention. But gaining “earn it” respect is worth it because it comes with the one thing that “command respect” doesn’t in the average workforce: loyalty. If you earn people’s respect, you’ll never have to resort to commanding it again. This entry was posted in Attitude, Authority, Behavior, Career Development, Change, Character, Coaching, Communication, Effectiveness, Emotional Intelligence, Leadership, Learning, Motivation, Reflection, Work by John E. Smith. Bookmark the permalink.